This is perfect. Thank you very much for this. Have a nice weekend. Restaurants rely on their chefs to create sumptuous meals for their customers and if you are looking for work in this particular career, you will need more than a good resume to catch the interest of prospective employers. You will also need to write a chef biography that will highlight your skills in the kitchen as well as your experiences in creating mouth-watering dishes. However, not everyone can write a professional looking biography. Most are wondering what should go in their bio as a chef? 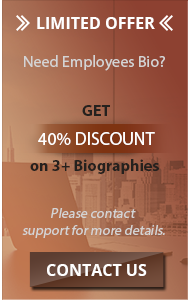 That’s where our biography writing services can help. It’s true that biographies should be written in a professional manner but sometimes adding a bit of personality to them can make them more interesting to read. If you’re going to look at samples of biographies for chefs, you will find that some are written with flair. These are the biographies that are easily remembered by the readers because they are interesting and offer more information. You too should give life to your writing but still maintain professionalism. Introduce yourself. 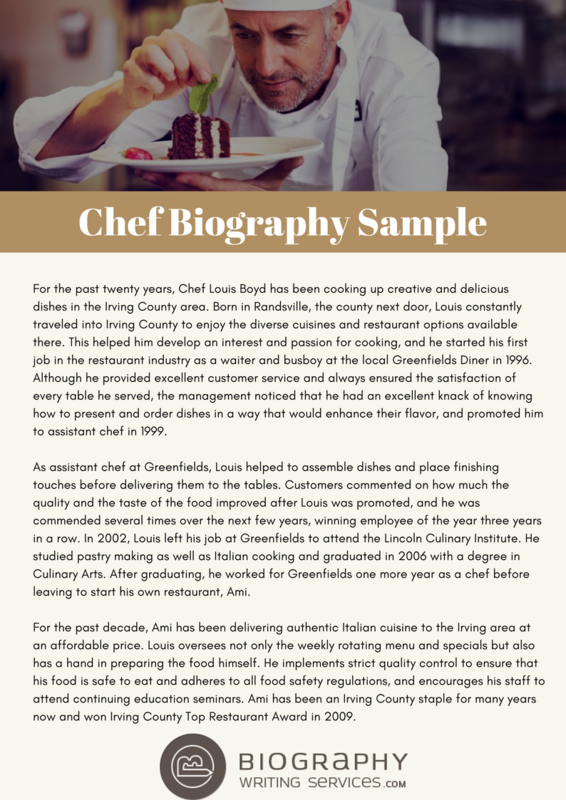 If you’re going to look at popular chef biography examples, you will find that the first part is usually dedicated to introducing the said chef. You should give your readers an idea of who you are, what your current work is and position, as well as where you are working at the moment. Skills and experiences. Your biography should focus on your skills and expertise. If you have a specific recipe that you are known for you should add it in your bio. Talk about your experiences as a chef, what knowledge you’ve gained along the way, and even what cuisines you are great at. Background, awards, and interests. You should also talk about your education in your biography as well as what pushed you to become a chef. If you’ve received awards or recognition through your cooking, make sure that you mention them in your bio too. Interesting facts about you. Show your readers who you are outside the kitchen. Tell them what you do during your free time but don’t list everything you do. You can write your interests in brief so the rest of your bio will be devoted to highlighting your best skills. Contact information. At the end of your biography, you should include your contact information so that your readers will know where to reach you for more details about your work. A good chef is always known for his exceptional culinary skills, but not all the chefs get the chance to prove their culinary skills and ultimately win a good job. 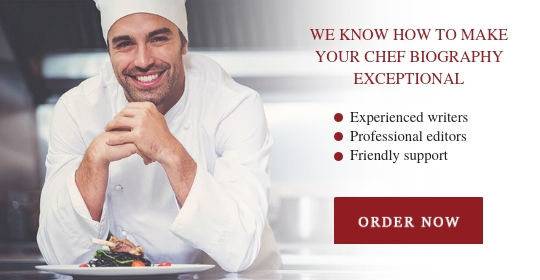 Only those chefs get the chance of showing their cooking skills, who apply for a chef job through amazing and exclusive biography. Following are the tips to write best chef biography. Only those chef biographies are shortlisted in a place in which the strengths and key expertise of chef are highlighted at top lines of a resume. It is very important to showcase the strengths and specialties of the chef in a highly beautiful way to attract the reader at first sight. If you are writing a chef biography and have won any chef competition or some beautiful title, you must have to write this title or honor just below the title of your biography. This is a very workable tactic to fascinate the readers. If you have invented some new recipe and you are confident about its good taste and uniqueness, this could be your ultimate point that can lead you towards shortlisting. You must have to mention this in your specialties column. Presentation of food is as important as cooking the tasty food. If you have expertise in presenting the dishes very beautifully, you should mention this skill in your biography along with photos of your food presentation. Meet cook, vegetable cook, and more! Personal approach to every customer, and even more! 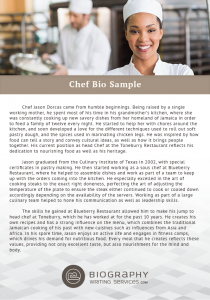 Your chef biography from our experienced team will be as sweet as your cookings. Call now and get it fast! Our Services Are Well-Known for Professionalism and Devotedness in Writing Biographies for Everyone!